Remote monitoring and notifications for your electric vehicle. 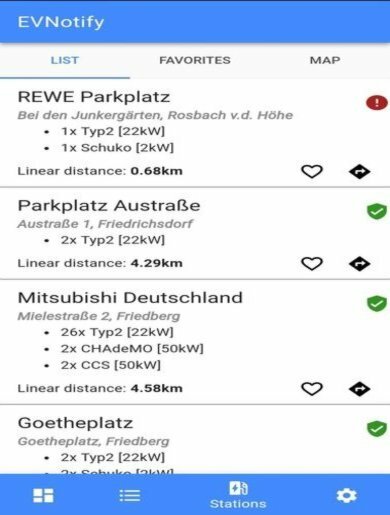 EVNotify allows you to read data from your electric vehicle. This not only allows you to remotely monitor the state of charge, it also allows you to record charges and drives. 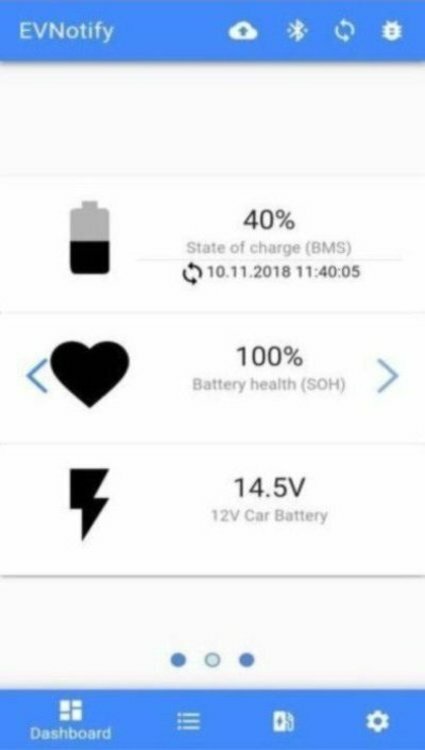 Ever wanted to be notified, when your desired state of charge has been achieved? Or if the charge interrupted due to an error? EVNotify gives you real-time-notifications about that. Keep an eye on your statistics, how much you consumed or charged and where you drove. It's easy and can be activated in EVNotify. No matter where you are and when you use EVNotify. It's available. With completely new web interface you can retrieve data from every device. From everywhere. Anytime. 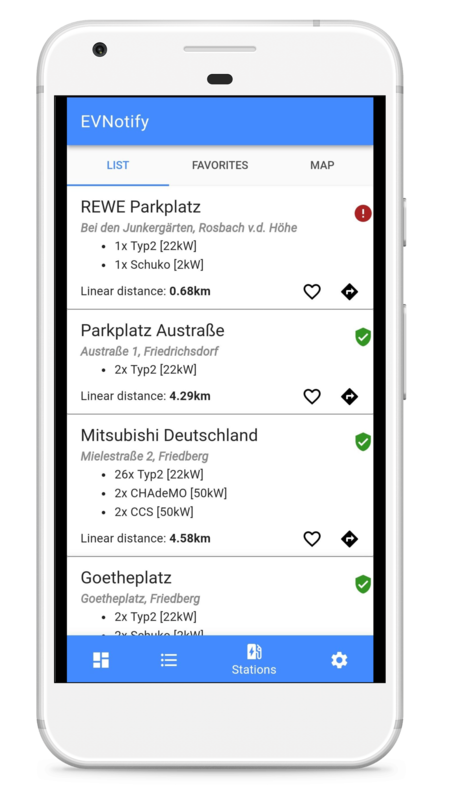 The station integration helps you to easily find nearby charging stations for your electric vehicle. In the near future with exciting new features. Once the easy first-time setup was made, EVNotify automatically handles and establishes the connection with the car, even when the communication interrupts. Within EVNotify you can be notified via several custom ways, such as mail, telegram or Push-Notification. Platform independent. Real time. The implementation of more and more advanced machine learning algorithms gives you very accurate predictions and will help you in your daily life. Why should I use EVNotify? Because many cars don't have the possibility to remotely monitor data. And even if they have - the app might be bad or the manufacture will simply drop support after a few years. Often they want you to pay for the service. EVNotify is free and completely open source. And under continous development. You can bring your ideas in the app. 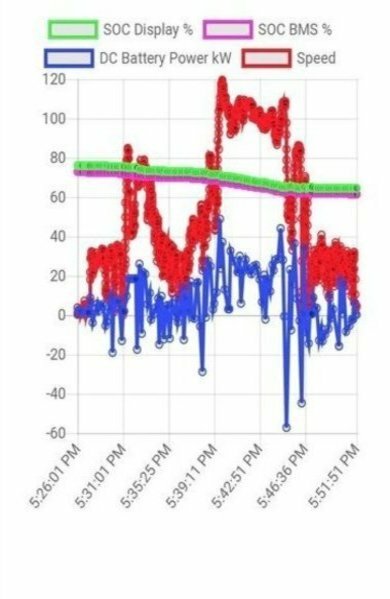 But you might be asking, why you need such an app to see your data. Image the following situation: You are on a road trip and you charge. 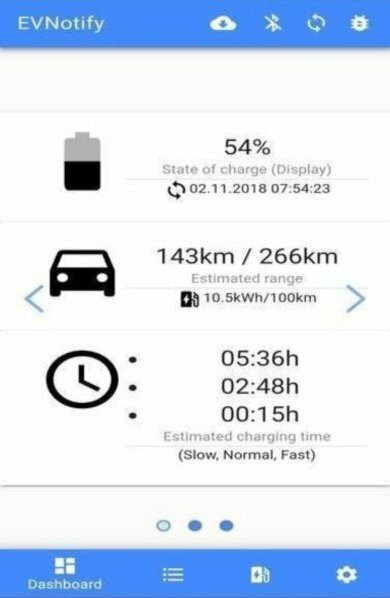 While charging, you are drinking a coffee - and you want to know, when you can end the charge and continue with driving. Without EVNotify you can't. But with EVNotify you can sit in the Cafè and watch the state of charge increasing. Or another situation: You go back and the car charges. The charge interrupts due to an error. After two hours you come back - the car hasn't charged. With EVNotify you will receive an instant notification, if charge aborted. EVNotify also helps you to track your charges, consumptions and drives. 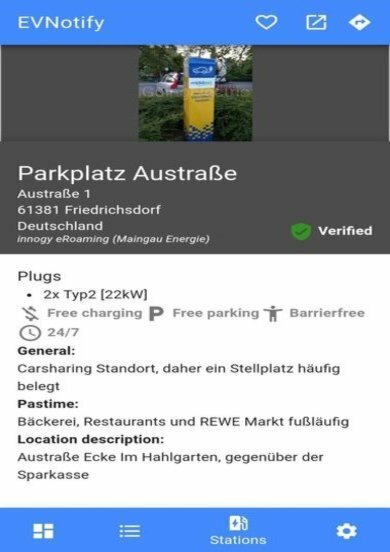 It can also help you to find nearby stations to charge your electric vehicle. What do I need for EVNotify? Download the app on the Google Play Store. You currently need an Android device with at least Android 4.1 installed, Android 6 or later is recommended. Furthermore you need a bluetooth-capable OBDII-dongle. To retrieve the data you can simply use another device with EVNotify or use the web interface (compatible with any device). It's free. And it will stay free. It's not sponsored. It's not advertised. It's built and financiated from a young, enthusiastic developer that wants to solve problems instead of complaining about them. Which cars and platforms are supported on EVNotify? Sender in the car, that reads data from car, currently needs to be an Android device. The device, that retrieves the data can be any device when using the platform independent web interface. More platforms coming soon. Many cars are now supported. Most of them only have basic support. See wiki for more information. How can I use EVNotify? Download the app. Plug the OBDII-device in the OBDII-port of your supported electric vehicle. Charge or turn the engine on - open EVNotify. Create an account. 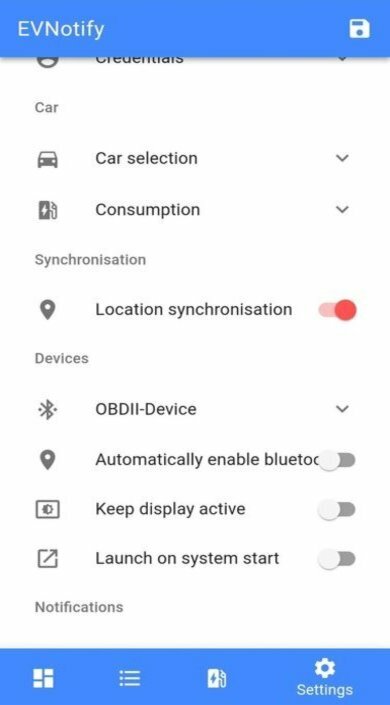 Select the OBDII-device, your car and apply your settings. You are ready!